I lost this book for a few days, just in the middle, just as Renee is being cajoled into falling in love with Maxime. It was torturous, leaving off like that, but not like in a normal way because it seemed clear how things would end up - or there were only two ways it would end, and both were not difficult to imagine. It was more like the feeling you have when you've done something wrong, and you know you're going to be found out, and you just want to go through the confession and get it done with, so you can feel just the shame, and no longer the horror. The book was sure to make you feel, whatever the ending would be. The feeling was easy to imagine. But it was frustrating, not being able to just feel it and be done. My wife found the book yesterday evening. The days between were the sorts of days that made me feel like I had been best losing the book for a few days. I read the clear little mating dance of the two last night, while doing nothing at all, one of those feelings that you indulge in, even though it feels horrible while you are doing it. I woke up this morning, and helped the boys strip down their bedsheets, and make their beds with new ones, just before sitting down to read more, now about the dishonest, tender way that Renee slides into the role of lover, and I went in the kitchen and separated the ground beef into individual packages just as the two mooned over each other, and Renee struggled with whether to fulfill her tour with Brague, and just as she was murmuring out her quiet little choice to go, just as she was murmuring out her little dreams of them heroically writing to each other while she was gone, my hands were kneading out the last little wedges of col, damp-oily meat, and I put them into the freezer just as she was discussing her trunks with Brague, closing the door on them, just as she was talking about her little grasshopper green dryad's costume. Amanda gathered up her things to go to book club, and kissed me while Renee got on her trains and wrote a lonely letter back to Max, and I ached with the complexity of her desires while I ate a plate of day-old seafood enchiladas, with this thick, salty cream-cheese sauce that makes my stomach ache when it's cold. The boys patiently played their own games, and Laurence asked me to put on a CD of children's songs. I listened to 'My Bonnie Lies Over the Ocean, as she wrote her quiet, pitying dishonest letters back to him, and in the end, as she writes her letter of farewell, and leaves to tour again, I cobbled together the leftovers for the boys' lunches, mixing the dreams about South America with the mingled smells of spanish rice and refried beans. And then, just as I wrote the ends of this review, Laurence called saying he was ready for his nap, and I came in and let him borrow my big stuffed Eeyore, and hugged him, and we sang Dream a Little Dream, and his breath smelled like curry powder and milk, and I probably hugged him tighter then was warranted by the situation. And it was there, joking about him sticking his elbow in my face, that I wondered how one ends a review of Colette? How do you talk about the feeling, the strange desire for everything and infinite regret that comes at the end of reading Colette, and how do you warn someone about Colette before they read it? I realized I really have no idea. I'm glad I found it. How does this compare to the other Colette books you've read? It's hard to say... I'm never really sure how to rate/review/judge Colette books. Every time I read one, I feel differently, and Colette doesn't relaly write literature, it's more like reading your own feelings. So, if I'm not in a place where I feel like Colette, I don't get as much out of the book. If I do, the book is amazing. It almost sounds like life imitating art. Weird review, though. I enjoyed how you relayed your feelings as you were doing different things. It made it quite interesting to read. Very creative! I love the word torturous. Alot of great descriptive words in this review! Wikipedia has a nice article on Colette. A strong woman who tells her gold-bricking husband to take a hike. And I'm hard-pressend to think of another author from that time-period who was known by only a single name. Stendahl was in the 1800's, just before her with one name, that's the best I can come up with. 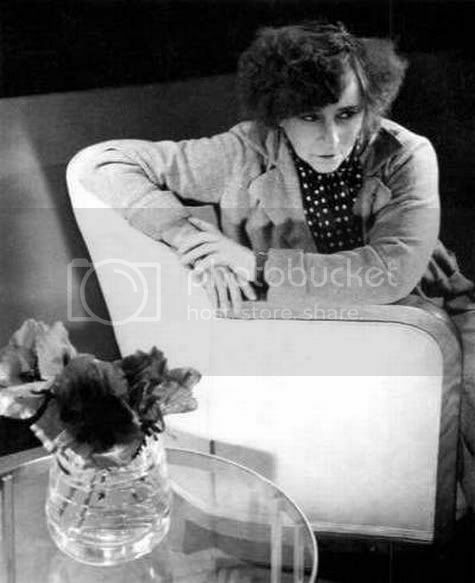 The interesting thing about Colette is, she was very honest about how grey she was. Like what you mentioned - leaving Willy, who was indeed a complete bad-person-jerk. Even after the divorce, she'd meet up with him, and she pined after him. One of her books, actually, pretty much discusses that marriage. And, I just have to say it, she had the most fascinating face. Especially the nose. ;) The only person who had a more interesting nose is, probably, Tycho Brahe, who had to make himself a metal nose after his real one got cut off.